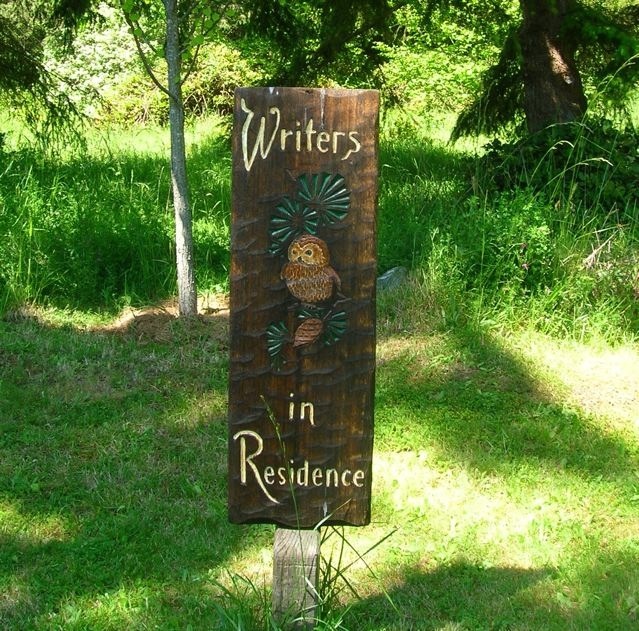 In less than two weeks, I will be spending 14 days in writing isolation/bliss at Hedgebrook, a writing residency on Whidbey Island in the Puget Sound, Washington. It will probably be my last opportunity to get a good chunk of writing done before the baby and book launch, so I am anticipating taking full advantage or worrying myself into a stupor that I didn’t write enough. My only previous writing residency experience was at MacDowell in 2004 and it was amazingly, astoundingly productive. I’d never written so much in my life. And those chapters, ironically, remained the most in tact of any in the novel. That’s what happens when internet and phone service are taken away from you. It’s just that simple. Now before I became a mother, I would have obsessed over what to pack. But the primary thing I’ve done in preparation for this writing residency is try to get childcare lined up for Amelie. Matt teaches an afternoon class in SF two times a week, so we have this odd window of three hours where we need someone to watch Amelie, who has loudly insisted every time the subject comes up that she doesn’t want a babysitter–only mommy or daddy. That is an entirely different post about the enormous weight of mommy guilt I am feeling about leaving for two weeks. So the babysitter search continues, but in the meantime, I also need to compile a list of things to pack. Luckily, google directed me to some great blogs that have already covered packing tips for writing residencies, most notably Nova Ren Suma’s, Christine Lee Zilka’s and and Christy Strick’s posts. I am especially looking forward to packing primarily pajamas and loungewear since I will be alone most of the time in my own cabin. I made the mistake at my last residency of packing too many other clothes, when really I wore the same pair of sweats the entire time. Also, it’s not like I have much wardrobe to bring since I’m almost seven months pregnant. I currently rotate between five long sleeve shirts and three pairs of maternity pants. So what’s coming with me? Space is at a premium, and since I have to carry it on the plane and a ferry all by my lonesome, I need to be smart and choosy. Laptop, obviously, though I need to empty out the last five years of pictures from my hard drive, which is slowing down my creaky 2007 Macbook. A few, select print books, specifically love stories and the history of Vietnamese rubber plantations. Ipad: for under the cover snuggling with some e-books. Index cards and thumbtacks for character bibles and plot points in the novel. The two notebooks I found in Paris over the summer that have become my visual inspirations on who my two main characters should be. My five long-sleeve shirts and three pairs of maternity pants. Three pairs of soft, comfortable pajamas, slippers, luxe socks. Puffy jacket, rainboots and umbrella—this is the Pacific Northwest. Towel and toiletries for showering. Postcard stamps, for those evenings I miss my family and friends. Room in my suitcase for Pacific Northwest goodies that we miss. External hard drive? Still debating. This entry was posted in Uncategorized and tagged writing, writing residency by aimeephan. Bookmark the permalink. Glad you found my post on what to pack for a residency helpful. I am seriously jealous you are headed to Hedgebrook. Would love to go there one day. Am in the midst of trying to figure out where to apply next. YES YES YES take the external hard drive. You do not want to lose any of the brilliant work you will no doubt do. Safe travels, and good writing. Thanks, Christy! I highly recommend Hedgebrook. It’s been wonderful so far. And I’ve been backing up via cloud, email and hard drive!